I am building a model of the USS North Carolina (ACR 12) for the North Carolina Maritime Museum. Plans FINALLY arrived from the National Archives three months after ordering. You will notice that I have drawn the ship as she originally appeared. Are you planning a 3D version? Would you be willing to share digital copies of those drawings? I would love to add the best digital versions of those drawings you'd be able and willing to share to those on the site. I'd happily affix a placard with whatever credit/restrictions you'd care to place upon them, in a manner similar to the ones I have in place. I'm limiting the 3d version to just the hull, and I'm only doing that in order to make sure that everything matches up correctly. 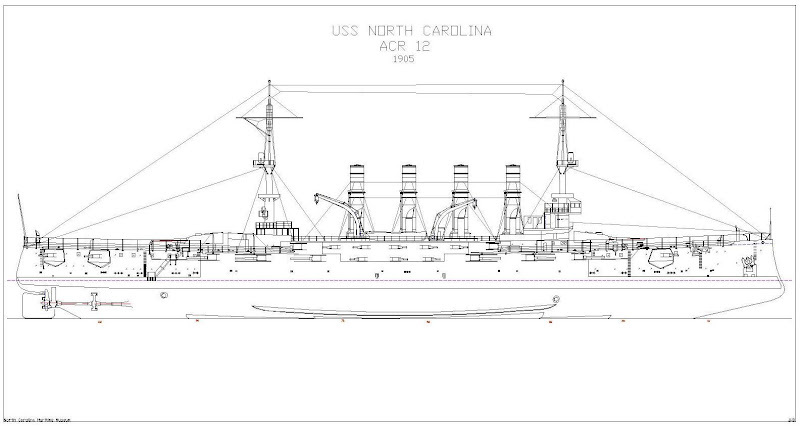 The drawings are for a physical model I am building for the North Carolina Maritime Museum. I would love to make the drawings freely available, but I may not be able to because I am doing this as a volunteer of the Maritime Museum. I'll have to talk to Paul about who actually owns the drawings. Ok, it looks like I'm free to do what I wish with my drawings. Tony, do you still have my email? Would North Carolina and Washington (later Seattle) be the same class? They appear simular. North Carolina and Washington are both Tennessee class. According to the USN, BB43 and BB44 Tennessee and California respectively were Tennessee class. BB56 Washington and BB55 North Carolina were classified (North Carolina). I drove by the North Carolina and wished I had the time to tour it but I had little time and an appointment on Misery Lane, Cape Fear (no joke, this is an actual address). I did have the opportunity to tour BB60 (South Dakota Class) USS Alabama several times. I think he was referring to USS Washington (ACR-11) and USS North Carolina (ACR-12) - they were both Tennessee class. Washington was later renamed Seattle and North Carolina was renamed Charlotte to be in line with battleship and cruiser naming conventions. I see now the early classifications. I keep forgetting pre-WWII, sorry I'll keep my mouth shut in the future. No - it can be terribly confusing. Some of those ships had 3 or 4 different classifications and 2 or 3 different names. My bad,.. I should have made the ACR note. It is confusing at times. I was thrown earlier when I saw a "CA" in place of "ACR" for the same ship. FYI Paul, these ships being mentioned are pre WWI,.. The ship Brooklyn I mentioned in another thread was a veteran of the Spanish/American war. And no joke about the address? Wonder who thought that up? The "Big 10" ACs were as big as the USN pre-Dreadnought BBs, hence were given state names; the were renamed after cities in their states when the names were assigned to BB hulls (some never completed). *relative to the frame numbering and the location of everything else. I saw you are building the Washington,.. are You building a 3D or a Physical model?